Sometimes it feels as if our heroes are all that are worth remembering in life. In today's sports world, faces and names come and go quicker than you can say brittle material. In football, the hero and legend status are doled out far too easily. Despite an exit from football more than 30 years ago, Earl Campbell's name still packs the same heroic wallop. His memory in the hearts of the public deservedly legendary. It's been more than three decades since the 5'11", 232-pound ball-carrying bull from the University of Texas, joined the Houston Oilers as the first player taken in the 1978 National Football League Draft. One year earlier, Campbell was a consensus All-American and the Heisman Trophy winner. His painstaking style of running earned him induction in the NFL Hall of Fame, in 1991. Campbell's game revealed itself in a character of black and blue shades. His type of sport was more about combat and collective risk -- to himself and to the opposition. When he joined the NFL he was adequately humble and adequately in touch with the reality of the sport and position he played. "I think that a lot of guys, they get out of football and they are lost," says Campbell, 58. Guys have been instructed on what to do from seven to five every day, and told what to do and not to do, and that's a hard switch. I tell guys at the university level to try everything they can to be a student-athlete, but to really learn how to be a student, and to get a degree. Football will outlast you, and that's what coach Bum Phillips always said. I always listened to what it was that he was saying. Eight years went by so fast, it was unbelievable. I made preparation, and I was always thinking about life after football, even after 1978 when I was drafted. I got a Bachelor's degree. I was always thinking about life after football. Part of his life after football is Earl Campbell Meat Products, which has manufactured sausage products for retail and food service sectors. Campbell's popular hot links deliver a unique Texas flavor that harkens back to his childhood. I used to barbecue a lot when I was in pro football. I had the guys coming over every now and then. At the University of Texas, even back then, there were two guys who wanted to meet me and talk about a business, and that started the ball rolling. I was fortunate enough to have an accountant, a banker and a financial advisor, meeting once a month, starting my rookie season. Fortunately, I found a company, and the good Lord has blessed me. Business wasn't a smooth ride for Campbell. In fact, when big Earl spoke, at first, some were not too keen on responding to his questions or suggestions. Early on, it was hard to get people to respect my ideas. I was told a bunch of no's. But persistence, it's all persistence. At the beginning, people didn't want to listen to Magic Johnson about business. They didn't want to listen to him, but they wanted his autograph before the meeting. When you sit in the office, you have to know what you are talking about. Sometimes your friends would say, 'are you serious?' You start asking yourself if you are serious. It don't hurt to have those personal accolades behind your business. I realized it was a good idea to get good people around me. I was thinking, 'hey, you as an individual, you don't know everything, you don't know all of the responsibilities.' It was better to take heed of what they are saying. It's been a great ride. When people hear about the success, they don't know what you went through. Born March 29, 1955, in Tyler, Texas, Campbell grew up with 10 brothers and sisters. His mother worked in the rose fields. Dad died when he was in the fifth grade. Around that time, he started playing flag football. Tackle football followed in the eighth grade. His earliest memories revolved around football, and, well, barbecue. In Texas, everyone thinks that they can do their own barbecue, and every man thinks he's the best at it. My dad was gone, but there was always a brother, or a neighbor, thinking that they could cook. There was always someone out there doing a brisket. Campbell's Tyler High School won the state football championship in 1973, at a time when the city of Tyler was deeply split racially, and integration was still a freshly introduced concept. "That was the thing that brought the whole city together," says Campbell. "We've got a long way to go, but, boy, we have come a long ways." In 1978, he was named the NFL's Most Valuable Player, All-Pro and Rookie of the Year. His running was never to be confused with high-brow artistry or classical ballet. The field was a battleground and he was at war. On a Monday night game (November 20, 1978) against the Miami Dolphins he rushed for 199 yards and four touchdowns to lead the Oilers to a 35-30 victory. Campbell played football with his whole body, his hands, head, face, and shoulders. Who can forget him spearing his head unforgivably into the guts of the opposition? Testament to Earl's structural endurance, he missed only six games out of 115 because of injuries. He was never fearful of shifting his weight and starting another aggressive push into a defender; he moved as if inspired by some stronger form of gravity. His finest year statistically came in 1980, when he rushed for 1,934 yards, at the time the second-highest single season total. In his eight-season career, Campbell rushed 2,187 times for 9,407 yards, and 74 touchdowns. It's amazing that even though he hasn't played ball since 1985, people are just as happy to see him as if it were yesterday. When people see him in the airport, they freak out. He is always doing something or going somewhere. There are a lot of things that may surprise people about Earl. Like the fact that he and Willie Nelson have been friends for more than 30 years. Pure and simple, America is obsessed with football. We're obsessed with a sport in which men tolerate pain and gnarl their bodies, obsessed with the twisted wreckage, and the high-velocity reality of bravado. Campbell understands this obsession, and he doesn't see the need to modify the game or attempt to make it gentler. He doesn't need to engage in any highfalutin intellectual debate about it. Figure skating it isn't. Period. "It's not supposed to be elementary school flag football," says Campbell, "with no bumping or hitting. That isn't football." Earl Campbell was a glorified superhero of brute professionalism -- and his body has paid the price of that violent absorption. In 2009, Campbell was recovering from his fifth back operation after being diagnosed with a genetic condition called spinal stenosis -- in other words, his spinal cord canal narrowed to the point that it compressed his nerves. To mute the incessant pain, his doctor prescribed high-potency pain medication. Soon, he began mixing the Vicodin and Oxycontin with Budweiser. Nothing about addiction is ever prettily orchestrated. Pain eases. Pain is tamed. But then the substances overwhelm. Campbell began fumbling his words, alienating family, struggling to remember formerly familiar things, and squandering important business opportunities. His two sons, Tyler and Christian, told their father one morning that they worried about his health, and that they would be admitting him to a rehabilitation center. That, he says, was without question "the lowest point in my life." He went along with the scenario. But at first, he was incredulous about his needing clinical help. "I didn't believe I belonged with people hooked on heroin, cocaine. But I began to see myself in all of their stories and realized that we were all fighting the same fight." The date of November 16, 2013, marked Campbell's four-year anniversary of being clean of alcohol and painkillers. "I am incredibly fortunate to have my family's support and access to medical care and addiction treatment care. Other individuals and families who battle addiction aren't so lucky." Campbell believes that God rescued him from the destructive throes of addiction. "I thank God for the support of my family and fans," says Campbell. Earl Campbell has a deep connection with God -- and his abiding sense of gratitude underscores the closeness of that relationship. I got away from the basics, and now I'm getting back to the basics. I tried all of the weak, fast stuff. I can say that if you don't have God in your life, it won't last. If you tell Him thank you for what He has done in your life, he will do more for you. Man wakes up in a different world all the time, the only thing consistent, and that doesn't change, is God. You can dial him up anytime. Nobody can stop you from talking to the good man, and to express, and to holler. My mother raised us in that Baptist church. I go there now, and even though she is not here right now, I go there and I thank her for what she taught us. 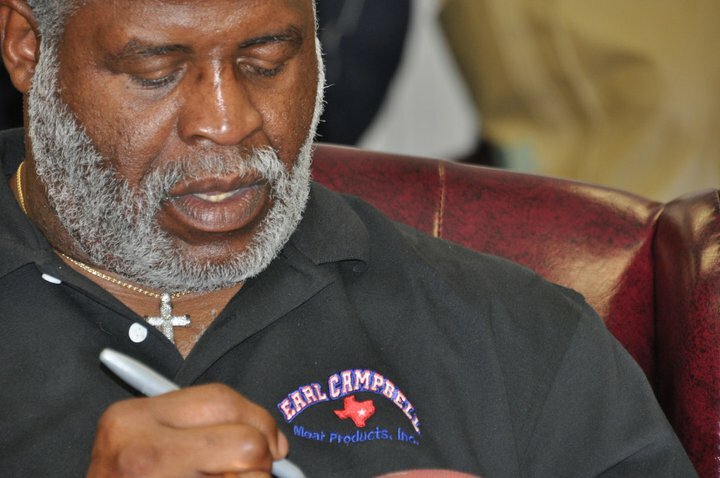 Earl Campbell helped pave the path of modern football as the primal thrill of violent sports entertainment. There was a time when he was blessed with the power of a locomotive and he could demolish a defender with a single spear of the helmet. But that was then, and he is a different man now. Crippled by the game that he loved, he leads a life of wheelchairs, walkers and canes. Despite the physical setbacks, that misery that had once bowed him over is all gone. When he talks about gratitude, he is just as captivating as he was when he once walked down the runway, ready to engage in battle on the football field. He is wiser, more learned, a bit more pious, and he has no reason to ever hang his head down. 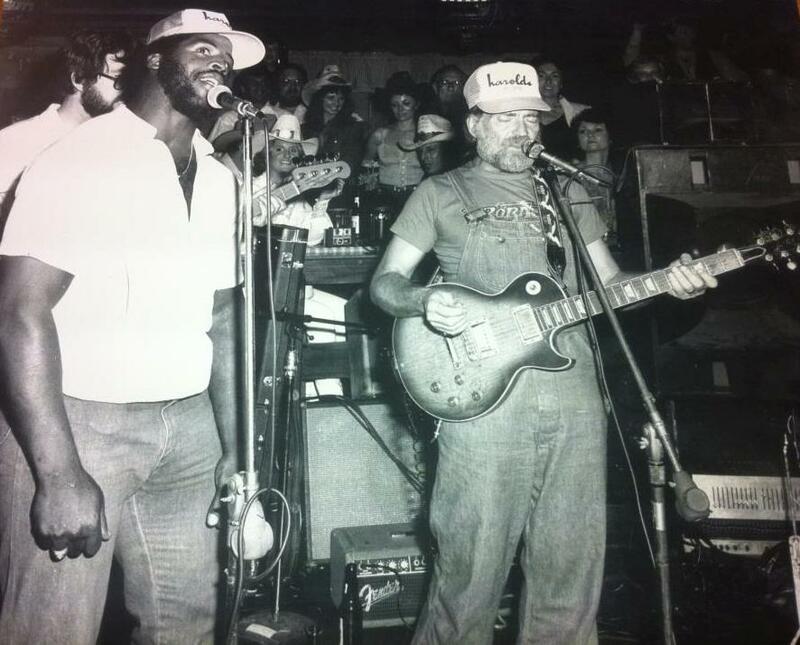 He's Earl Campbell -- and we still love him. "I've learned in life that we all go through things," says Campbell. "But you don't get there all by yourself. That somebody, and that something, that is with you all of the way, that is Him." Brian D'Ambrosio is the author of 10 books, including a recently released book about the lives of former NHL tough guys, "Warriors on the Ice: Hockey's Toughest Talk."